We were fairly confident that Apple would be announcing its smaller tablet, the iPad mini, at Tuesday’s keynote, but we weren’t as sure about the Mac mini. Though rumors suggested we might see a refresh on the 15-month-old Mac mini, we weren’t holding our breath. However, Apple launched three new Mac minis at the event, including the 2.5GHz Core i5 version for $600 (shown below), an upgraded 2.3GHz version Core i7 version for $800, and the top-of-the-line Mac mini OS X Server for $1,000. All three versions are available to order, but should you go with the new and improved model, which is still Apple’s smallest and most affordable computer, or should you look into buying an older, refurbished model? Considering that the specs between the two aren’t drastically different, you might want to think about the latter if you’re on a tight budget. 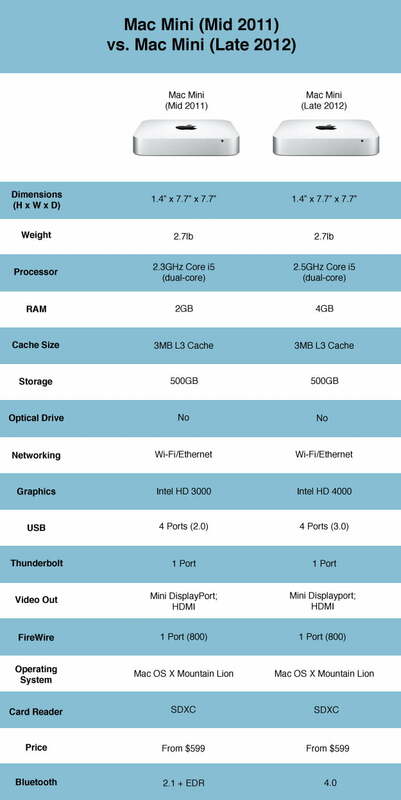 Read on to see how the brand new Mac mini stacks up with July of 2011’s version. It appears that Apple might be sticking with the old saying: “If it ain’t broke, don’t fix it.” There are minimal upgrades to the new Mac mini, so those who already have a Mac mini from 2011 need not rush out to buy a new one. If you’re thinking about investing in a Mac mini — after all, Apple’s senior vice president of worldwide marketing, Phil Schiller, did say it’s the world’s most energy-efficient desktop — then you might want to consider buying an older or refurbished model for a slight discount. Aside from the upgrade in OS, slight bump in graphics, and 2GB more RAM at the base price, there aren’t a ton of new features that make the 2012 Mac mini outstanding. If you can get your hands on a 2011 model for $400 or less, it might be worth grabbing while you can.